the applicant had provided the wrong type of police clearance. as well as, of course and inevitably, priorities, staffing shortages, workloads and backlogs in DIAC's Visa Processing Office - which are largely beyond the control of the applicant (and the Migration Agent). Submitting a visa application is a complex business. And it is expensive. 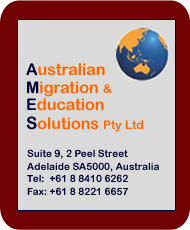 To maximise their chances of success and minimise problems and delays, many people therefore engage the services of a Migration Agent, whose job it is to make sure that you apply for the most appropriate and most favourable visa category and that your application fully meets the Department of Immigration (DIAC)'s requirements. The Agent's fees represent an additional cost, but given the risks, many people find it a worthwile investment. If you think your visa application is straightforward and you are prepared to proceed on your own, all the information, documentation, as well as all the forms you need, can be found on the Australian Department of Immigration And Citizenship (DIAC) web site - www.immi.gov.au. all of which means that you will be in safe and competent hands, with a guarantee that your case will be handled professionally. The cost of using a Migration Agent will vary depending on the type of visa and your individual circumstances. Details of current Migration Agents Fees are available from the Migration Agents Registration Authority's web site.